Save the orangutan - Friends of Borneo. Keeping it wild! If nothing is done to recover the habitats of the orangutan population in Sabah, the prognosis for the small groups is not good. Cut off from larger populations, genetic inbreeding will be one major cause for their decline. Limited supplies of fruit and nesting trees also exposes these smaller populations to hunger and starvation. Immediate action has to be taken in later 2012 to start rehabilitations of their habitats to provide corridors for all these populations to connect with each other. Enjoy this slideshow of wildlife found in Lower Kinabatangan and join our campaign today! The severely degraded eastern part of the forest, between the Sebangau and the Kayahan, is part of a failed rice project which drained large areas of peat forest in an attempt to create rice paddies. The forest has been damaged by legal and illegal logging. There is no longer any continuous forest cover where Orangutans may cross the river. A satellite view shows a grid of logging roads throughout most of the forest. This forest is home to the world’s largest Orangutan population, estimated at 6,910 individuals in 2003, and other rare or unique species. The total Agile Gibbon population in the Sebangau catchment is estimated to be in the tens of thousands, but is declining fast. Studies of the area shows that the hydrological integrity of the forest in Pulang Pisau regency has been kept, making it ecologically resilient. The area's proximity to the capital city of Palangkaraya however, makes it an easy target for further industrial developments. 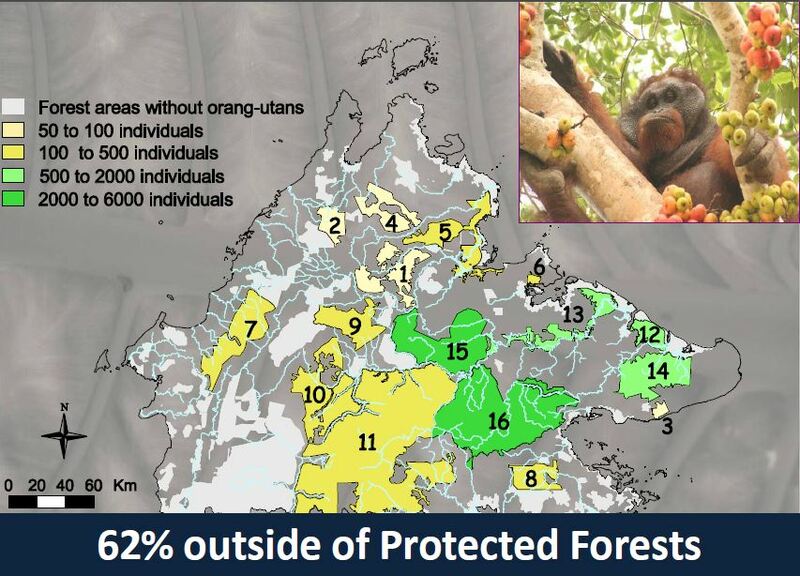 IUCN Redlist map of Orangutan distribution in Borneo.